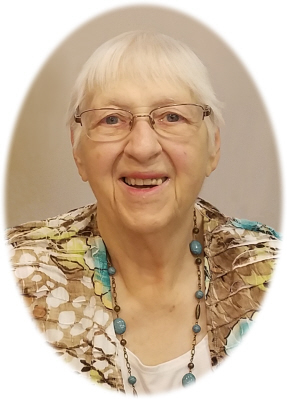 Doris Mildred Swanson age 86, of St. Johns, MI, passed away Thursday, March 21, 2019, at Grace Haven Assisted Living, St. Johns, MI. Funeral Services will be held at Smith Family Funeral Homes - Osgood Chapel, 104 East Cass Street, St. Johns, MI, on Saturday, March 23, 2019 at 11:00 A.M., with Pastor Andy Croel officiating. Burial will take place at South Bingham Township Cemetery, St. Johns, MI. Visitation will be held on Friday, March 22, 2019 from 2-8 P.M. with family present from 2-4 & 6-8 P.M. at the funeral home. Doris was born in Ovid, MI on January 25, 1933, the daughter of Harold and Pauline (Simpson) Coffman. She graduated from of Ovid High School. Doris married Warren Duerr Swanson on June 21, 1958 in Maple Rapids at the Congregational Church. Warren passed away on September 23, 1993. Doris had worked at Sealed Power and also worked on the family farm. Later in life she worked at White's Bakery in St. Johns. Doris and Warren enjoyed playing euchre with the neighborhood card club. She also enjoyed swimming at the HS pool with her friends. Her family was very important to her, especially her grandchildren and great-grandchildren. The Swanson Family would like to say a heartfelt thank you to Sparrow Hospice and the staff of Vista Springs Timber Ridge Village, and Grace Haven Assisted Living for the care they gave their mother. She is survived by 2 daughters: Marsha Swanson Edington of East Lansing, MI; and Dana Swanson of St. Johns, MI; 2 sons: Jack Swanson of DeWitt, MI; and Wesley and Carrie Swanson of St. Johns, MI; 5 grandchildren: Warren Edington, Casey Compeau, Lacey Swanson, Hailey (Devyn Clark, significant other) Sibley, and Wesley Swanson; 3 great-grandchildren: Karson Swanson, Myah and Amelia Clark; brother John Coffman of DeWitt, MI; sister Linda Schultz of Arab, AL; brother Larry and Mary Coffman of Gratiot County, MI; sister Jane and Dave Swadling of Otter Lake, MI; and several nieces and nephews. Doris was preceded in death by her parents, husband, and siblings: Loretta Ballinger, Georgiana Bradley, Bob Coffman, and Hannah Vitek. Memorials may be made to Sparrow Hospice, Grace Haven Assisted Living, St. Johns, MI or Vista Springs Timber Ridge Village, East Lansing, MI. Online condolences can be sent to www.smithfamilyfuneralhomes.com. The family is being served by Smith Family Funeral Homes - Osgood Chapel, St. Johns, MI.